It's about Time. 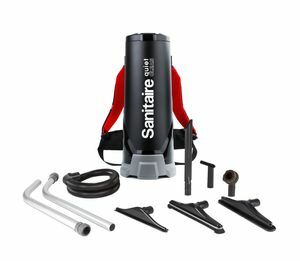 The most comfortable and quietest backpack Sanitaire has ever built. When indoor air quality is an issue, the Quiet Clean HEPA Back Pack is the ideal solution for keeping the air clear. With its load dispersion technology and comfortable harness designed for comfort, balance and heat dispersion, this cleaner results in less user fatigue, reduced turnover and greater cleaning efficiency. At less than 63dBA, the QuietClean BackPack Vac is ideal for cleaning locations where noise needs to be kept to a minimum. A large assortment of tools and attachments help clean every surface. CRI Seal of Approval Meets LEED Compliant. When indoor air quality is an issue, Washable Sealed HEPA filtration is the ideal solution for a HEPA level clean. Load dispersion technology harness provides added user comfort, balance and reduces heat dispersion, resulting in less user fatigue, reduced turnover and greater cleaning efficiency. Drives increased productivity when used as part of a team cleaning process. Clean 24 X 7. At less than 63 dBA, the Backpack Vac is ideal for cleaning when noise must be kept to a minimum. Washable Sealed HEPA Filtration When indoor air quality is an issue, Washable Sealed HEPA filtration is the ideal solution for a HEPA level clean. Decreased User Fatigue Load dispersion technology harness provides added user comfort, balance and reduces heat dispersion, resulting in less user fatigue, reduced turnover and greater cleaning efficiency. Increase Cleaning Productivity Drives increased productivity when used as part of a team cleaning process. QuietClean Quiet Operation Clean 24 X 7. At less than 63 dBA, the Backpack Vac is ideal for cleaning when noise must be kept to a minimum.